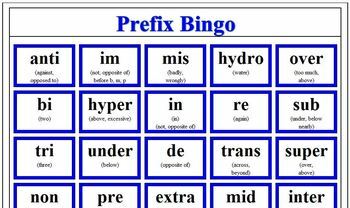 Prefix Bingo introduces students to 25 different prefixes with their meanings. There are five different sets of Prefix Bingo Call Cards (each set is color coded for easy identification) so that the game can be played five times before a word beginning in a prefix (call card) is repeated. 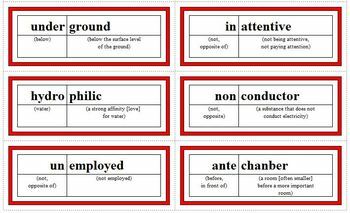 The 22 student playing cards contain both the prefix and the definition of the prefix. This product was designed with versatility in mind. There are large call cards (48 font) which can be read from across the room to use with large groups or for a prefix bulletin board display. Additionally, the call cards also come in a smaller size (20 font) for use with small groups or centers. 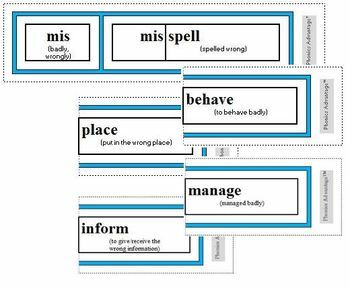 All call cards contain the definition of the prefix along with the definition of the word. 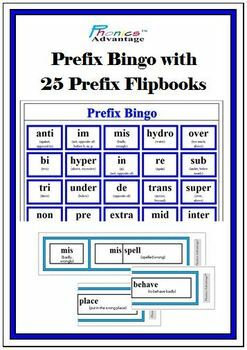 There are 25 prefix flipbooks (one flipbook for each prefix introduced in the Prefix Bingo Playing Cards.) Each flipbook contains the definition of the prefix along with the definition of each word. For comments or questions, you can reach me at: PhonicsAdvantageJanet@aol.com.